Hello aLex. Although many things in life seem frustrating and fruitless the process for worthwhile change is indeed a difficult journey. But eventually I am confident that in the near future we will prevail in achieving positive results for our community in this matter. I encourage you to become involved with Bike Lane Uprising. We will succeed for the good of our cycling community together. Thank you. 311 isn't nearly as responsive as they need to be, but we need people like Argonne to keep fighting the good fight. If no one called 311 or voiced any complaints then the lack of enforcement issue would be that much harder to overcome. I doubt anything is being done with the 311 data. When the city added the code to the 311 system to report vehicles in the bike lanes, they mentioned that they were going to use the data to identify hotspots. Well, I've identified several hotspots, and I've yet to see a single Finance Dept. ticket person in any of them. I also submit the reports to Bike Lane Uprising, and the group has made some progress. Unfortunately there is no provision in the law to ticket drivers after the fact. I'd love to see that change. I've personally documented close to 1500 violations in the past 2 years. At $300/$150 each, that's some decent $$$ for the city. 320 N Wells St. 311 report submitted. 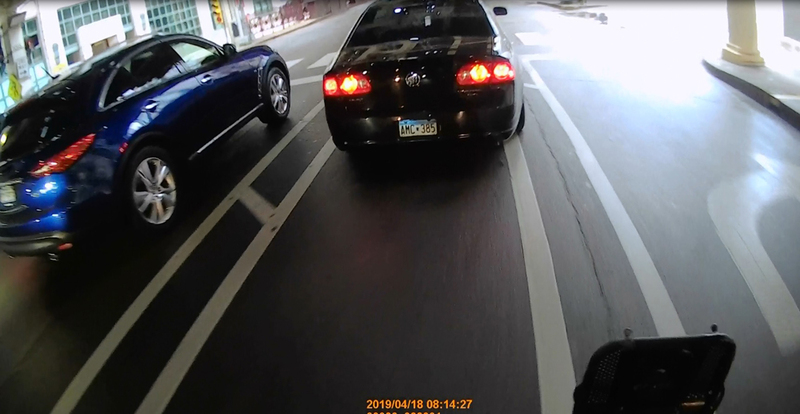 4-20-19 Lake Shore Drive early morning crash onto Lake Front Trail path upon the Diversey Harbor Bridge. Photo Credit: Stephen Boisvert. One Dead After Fatal Crash on Lake Shore Drive. 4-20-19 at 12:16pm. Those pics show what had always bothered me - how close to LSD the new LBP was put in. There are spots when it's that close or closer and where the speed are higher along the south side in spots. One version of the debate was that pedestrians would enjoy the path closer to the lake than the cyclists would but I wasn't in on those conversations. I wish the guard rails were a little more fortified in some spots.